I was looking for that special something to wear. The dress that no-one else has, the accessory that dazzles and hints of untold stories. So I head off to Judy’s Vintage Fair. Judy’s Affordable Vintage Fair only cost £2 to enter (under 12s are free). And it’s well worth it because you get access to the most eclectic range of beautiful dresses, quirky tops, classic jackets and more from the 1920s- 1980s. I start with the one-off designer dresses that instantly cause me to imagine perfect occasions to wear them. My dreaming is short-lived because I’m distracted by the collection of beautiful jewellery and gorgeous handbag. The embroidered Chinese design purse chants my name but I hold off looking for something to wear. I’m enthralled by a little white jacket. I try it on, hold my breath but unfortunately my shoulders let me down. Meanwhile my bargain hunters have gone off in search of the perfect shirt. Rummaging amongst racks of Hawaiian shirts and throwing some moves to the Elvis Presley soundtrack, they’ve clearly also fallen under the spell of the vintage fair. 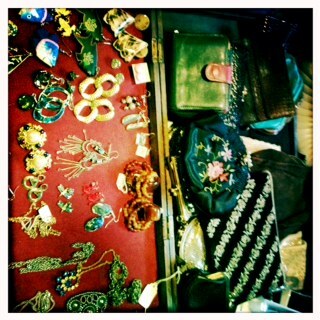 There are plenty of stalls to find a vintage bargain. And I did! A silk skirt with a retro print, unlike anything in my wardrobe for only £10. I’m delighted and it’s been a truly wonderful shopping experience. Judy’s Affordable Vintage Fair comes back to Glasgow this Saturday at The Briggait (141 Bridgegate, G1 5HZ) from 12-5pm. Go discover your unique bargain and strike a pose. This entry was posted in Fashion, Vintage clothing and tagged #inglasgow, About a city - Glasgow, Affordable vintage, Judy's Vintage Fair, what to do in Glasgow. Bookmark the permalink.